This is my sixth VeganMoFo post for 2014. For more information on this month’s theme, see my Cook from Books description here. I was initially drawn to buy Vegan Soul Kitchen because I was craving some good Southern food that I was missing from growing up in the South. But I wasn’t really looking for things like veganized biscuits and gravy or fried okra—although those are wonderful. I wanted something that offered freshness and spice, and not only took me back to where I grew up but also offered some wholly new-to-me dishes and ingredients. As I flipped through the pages of VSK by Bryant Terry and saw recipes like Black-eyed Pea Fritters with Hot Pepper Sauce, Succotash Soup with Garlicky Cornbread Croutons, Spicy Mafé Tempeh, Jamaican Veggie Patties and Carrot-Cayenne Coleslaw, I was instantly smitten. After reading through Bryant’s introduction and a handful of his recipe headnotes, I learned that VSK is much more than just a collection of Southern dishes that have been veganized. It’s a reflection, reinterpretation and modernization of traditional dishes he’s eaten from countries in Africa and the Caribbean, as well as African-American and Southern dishes in Memphis, New Orleans and other parts of the South. It’s also deeply personal, a celebration of what he refers to as “Afro-Diasporic cuisine” (a mixture of African, Caribbean, African American, Native American and European staples) with an emphasis on fresh and nutrient-dense ingredients. 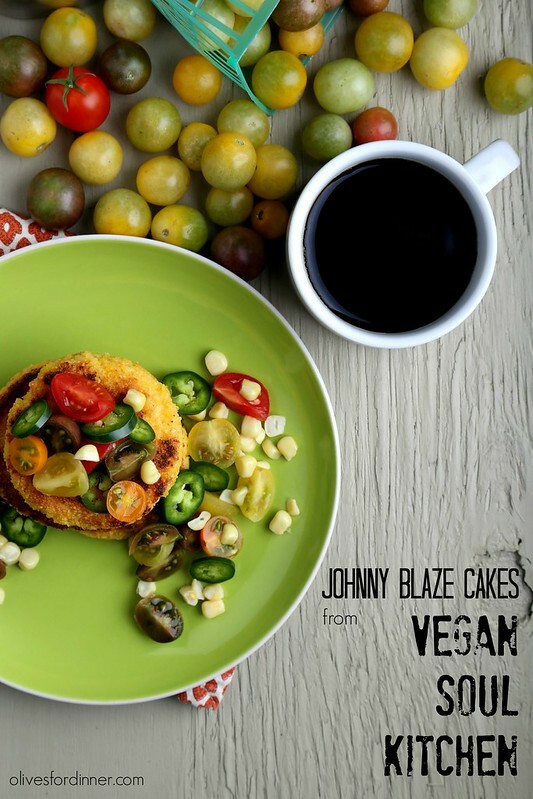 What you see here are Bryant’s Johnny Blaze Cakes, a beautifully simple crispy corn cake which utilizes a technique I had never heard of or tried before. What I like best about these crispy-on-the-outside-but-perfectly-soft-on-the-inside cakes are that they are sort of a blank canvas for you to put whatever you want on it. Craving something sweet and sour with a hit of heat? Bryant suggests his Strawberry and Slightly Hot Pepper Jam. Want colorful and fresh? 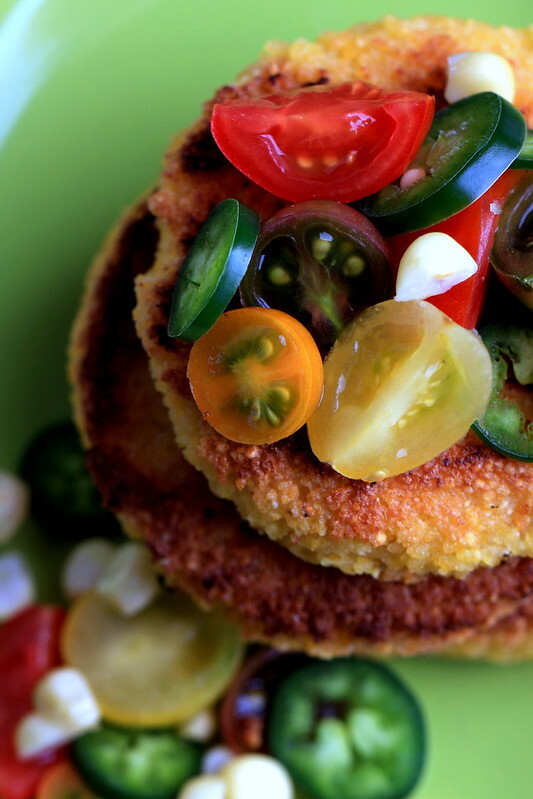 Try his Chilled and Grilled Okra, Corn and Heirloom Tomato Salad. 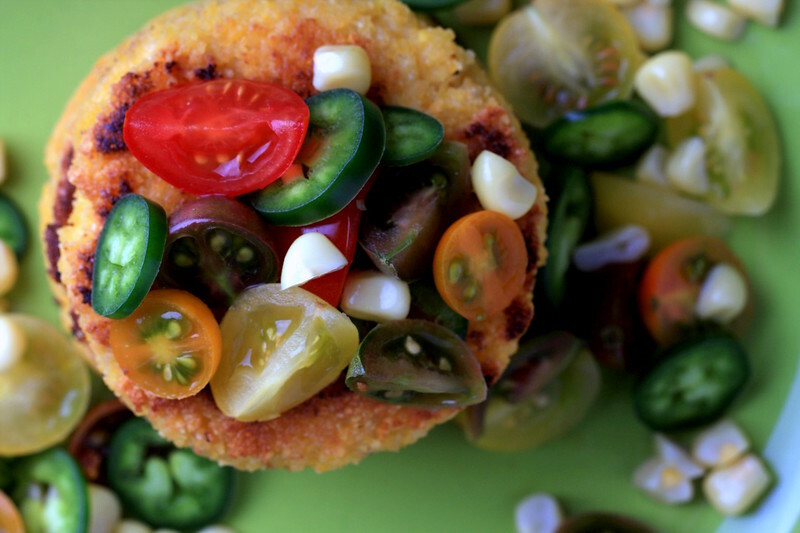 I topped these with fresh tiny heirloom tomatoes, slivers of jalapeño and grilled corn. I loved the little pop of breaking the crispy shell to reveal a pillowy soft interior, and these cakes could be topped with almost any kind of sauce, fresh vegetable or nestled up next to a bunch of cooked greens. The leftovers also reheated perfectly the next day in a preheated cast-iron pan. Next up to try? Bryant’s Roasted Turnips and Shallots with Turnip Greens Soup, Cold and Creamy Cucumber-Watermelon Soup with Pickled Watermelon Rind Salsa and his Spiced Peach Rustic Pie with Dried Cranberries. I've made this recipe before, which I paired with Bryant's Creole Hoppin'-Jon, and it was amazing! I highly recommend this book to any vegan looking to explore Southern food. All of the recipes that I've made so far are super easy yet exploding with flavor! Plus I love the book/art/music pairings for each recipe. Thanks for this post! I made these tonight with dinner because I needed something to go with our tomato soup. So good! Yum! This book is actually on my wish list and well, do I really need an occasion? I think I'll add it to my cart right now! Thank you so much for pointing out that recipe. I've only made one from VSK even though I totally like the tone and concept of the book. This looks so good! I LOVE your tomatoes…yum!